One of my VFC/Avalon AR-15 type AEGs, from factory condition to present day. I originally picked up a pair of these VFC guns (which were some of the first under the Avalon brand name) back in summer 2013. At the time I’d noticed a distinct trend amongst manufacturers of AR-15 style AEGs to move from realistic markings, such as Colt, over to fictional ‘trades’. As it it turned out my gut was right and shortly after I purchased these 2 it came to a point where you almost couldn’t buy airsoft ARs with any realistic or licensed trademarks, certainly not from any decent quality brands that I was actually interested in. 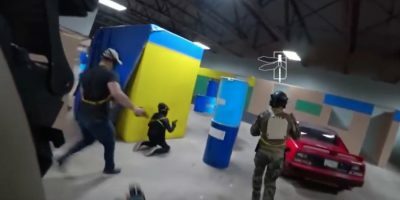 As of 2018 things have swung somewhat the other way of course and the total lack of realistic AR replicas has caused something of a resurgence of interest in non-fiction replicas, though the market is most definitely not back where it was 6 or so years ago. 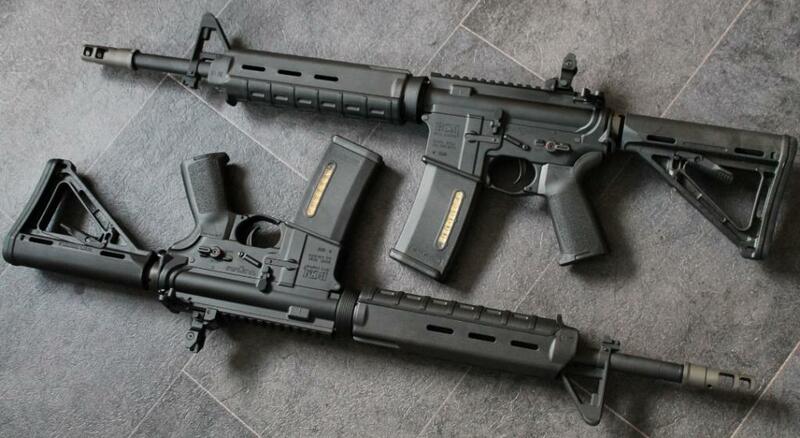 In their stock format these RIFs featured steel Surefire type muzzle brakes, mid-length faux gas systems with USGI type A-frame gas blocks, a full set of PTS MOE furniture to include handguard, pistol grip, trigger guard and stock, full BCM markings on the uppers and lowers, anti-rotation pins, Battle Arms style selectors, Gunfighter charging handles, PTS ASAP plates and BCM style rear BUIS. They also have a very odd feature in the gearbox for adjusting FPS whereby you adjust a grub screw that deliberately bleeds air from the cylinder as the piston compresses, though personally I find the internals of electric airsoft guns entirely uninteresting and I’ve not changed them much at all from stock. Otherwise they are functionally very much run of the mill mid-teens electric guns. The biggest change to the gun that I kept at 14.5″ barrel length (the other being changed to 11.5″) was the original Bravo Company Manufacturing KeyMod Rail. These were the days when the skinny freefloat tube was really climbing to a position of market dominance and cleaning up quad pic rails. 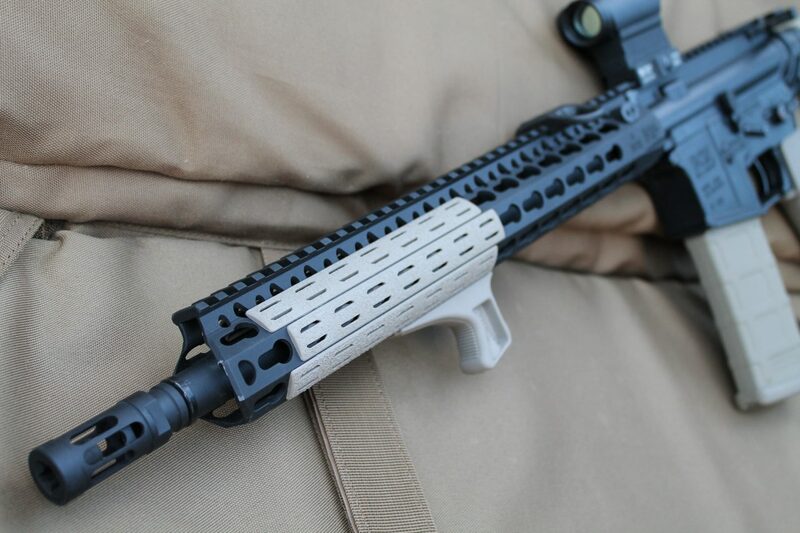 However the older style tubes with threaded holes for accessory mounting, such as those made popular by Troy and Midwest, were now being killed off by the rise of KeyMod. My KMR however is not the currently-offered Alpha which is of an all aluminium construction, it is the original type (i.e. no Alpha suffix) which is constructed of an aluminium-magnesium blend with a surface coating applied using a plasma deposition process. Quad pic rails were still fairly commonly seen floating around in both the civilian and military spheres at the time when these were released and 13″+ quads obviously are not lightweight; overkill in all regards essentially. 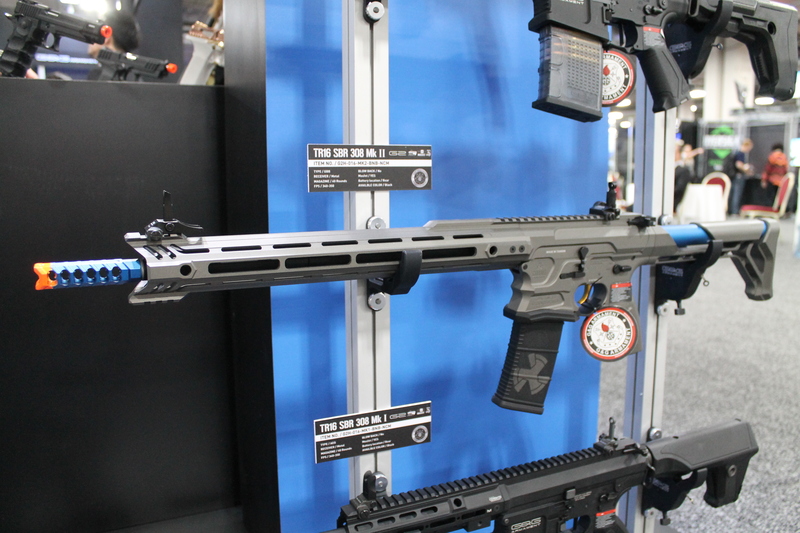 By comparison, weighing in at a mere 7.7oz with mounting hardware, the night-and-day handling changes experienced by purchasers of original alloy KMRs did an awful lot to help boost Bravo Company up in to the top tiers of manufacturers who specialise in ARs and AR accessories. Since I had what was at the time the per-inch lightest AR forend on the market now attached to the RIF, I also opted for what was the lightest stock on the market, that being the Mission First Tac Battlelink Minimalist. The WarSport (now ZRO Delta) rail bungees were all the rage at that point as well and in fairness they can still have application if you’ve got an awful lot of cables hanging around your handguard. The Magpul Industries RSA added to the 12 o/clock pic rail compliments the ASAP plate to facilitate swapping slings from single point over to 2 point configuration. The heavy and utterly pointless steel muzzle brake was removed in favour of a PTS/Griffin Armament flash hider that weighed probably 1/3 that of the SureFire replica. The last integral changes merely involved exchanging the PTS MOE pistol grip and trigger guard over to corresponding items in FDE. Also seen mounted in this image are an earlier model of Inforce WML and Primary Arms Micro red dot. Further down the line, having decided that since the core parts of the build were all BCM, I came to the conclusion I might as well go all-BCM. This wasn’t too tricky to accomplish since the main parts were already in place. By swapping the MFT Stock for the Gunfighter Mod 0 and the PTS MOE pistol grip for a Dytac replica Gunfighter Mod 3, the build was pretty much done. Credit to DLCustoms for fitting of the pistol grip, because the more vertical angle is something that’s hard to achieve given the way Version 2 Airsoft Gearboxes are setup to mount their motors at USGI A2 pistol grip angles. Fortunately King Arms had (years earlier) made a batch of airsoft copies of the BCM Gunfighter Mod 0 and Mod 1 compensators, though they were entirely unmarked and did not mention BCM in their product names so most people would have been very much unaware of where the designs had originated. By a stroke of luck I happened to find examples of both still in stock long after production had finished while randomly perusing eHobby.com one evening, so they were swiftly acquired. The (as it turned out unnecessary) rail bungee was replaced with BCM KeyMod panels and a KAG that the Haley Strategic store had on fire sale for about $9 some time ago. As uncool as it probably is by today’s standard, I’ve kept the Mil-Spec Monkey/US Night Vision magwell slap on the gun purely since the Death Mechanic logo holds such a firm place in my heart. 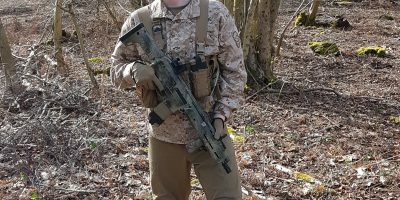 The 14.5″ barrel is without doubt not necessary in airsoft since a 10.5″ will give basically the same accuracy and muzzle velocity and KeyMod has very much lost the war against M-LOK, however I enjoy the US-civilian build aesthetic a great deal and if the compensator were hypothetically pinned and welded this gun would not fall under the SBR rules. There’s a temptation to switch over to something M-LOK such as the new MCMR line from Bravo Company, but these non-Alpha KMRs almost never come up for sale these days since production was switched over to the Alpha model some years ago. Also, since the 12 o/clock pic rail can satisfy any accessory attachment desires I may have and the forend is so feather-light, it just makes more sense to hold on to the magnesium alloy handguard at this point. Overall, an extremely light and ergonomic rifle that fairly closely replicates a very popular semi-auto AR-15 from the US civilian market.